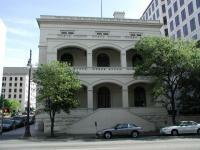 O'Henry Hall was constructed between 1878 and 1881, built to serve as both a Federal Courthouse and Post Office for the growing needs of the City of Austin. 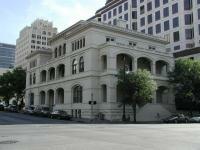 It served as the first permanent home of the postal system in Austin. 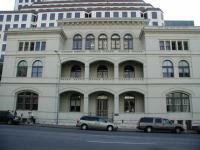 Prior to settling down at this location the post office rented space in office buildings. Indicative of the building's intended symbolism, the total cost of the structure when complete came to $225,000, not an insignificant sum in those days. O'Henry Hall is so named due to the fact that William Sydney Porter, a short story writer better known as O'Henry, was tried and convicted in this building for bank embezzlement in February of 1898. Porter had held a job as bank teller at Austin's First National Bank, but did so a number of years prior to charges being brought against him. For this crime Porter spent three years in jail, but there is ample doubt concerning his actual guilt. The post office eventually moved across the street to larger accommodations at 210 W 6th Street. The building continued to be used by the judiciary and other federal agencies until 1968. The government deeded the property to the University of Texas, who renovated it in 1971. Renamed O'Henry Hall at that time, The University of Texas System uses the building and the other old post office building at 210 W 6th for administrative space. Stopped by on the way home from work to be able to log this visit and associate pictures from a prior visit with it.